We have a large inventory of bronze elbows. Our bronze 45 degree elbows are available in many sizes to meet your required piping specifications. Allow us to facilitate your bronze fitting needs quickly with high quality bronze pipe products that resist corrosion. Our bronze 45 degree elbows come in a variety of sizes to meet almost any piping configuration. Our high quality bronze elbows meet the highest standards. We inventory a variety of bronze threaded elbows to meet your piping needs. View an overview of our product offerings. We stock a wide variety of bronze elbows. Please review our product dimensions to confirm your specifications. We supply a variety of quality bronze 45 degree elbows. Our pipe sizes and weights chart will help you select available, in stock products. Bronze elbows conform to ASTM B62-93 (85, 5, 5, 5) C83600. Dimensions ANSI B 16.15, Threads are ANSI B2.1 or BA21 and Fed. WW-P-460 UL/FM approved. View our standard specifications chart. 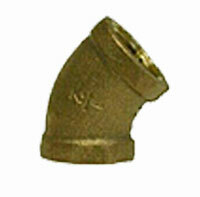 Bronze pipe fittings are ideal for tight seals around pipe. Bronze pipe elbows are used in many applications including various cold and hot plumbing, heating processes, pneumatic systems and marine construction. Bronze resists the harmful effects of corrosion.